Latest News: January 20, 2018: A group of researchers involving Alex Hayes has unveiled a new global topographic map of Titan and has shown that the seas of the north polar region may be interconnected via a subsurface reservoir of liquid hydrocarbons; March 17, 2017: New experiments performed by Michael Malaska and his team imply that the "Magic Island" phénomenon may be related to the presence of bubbles of nitrogen emerging from the lake or sea. March 4, 2016: The enigmatic feature known as the Magic Island which had been clearly identified in a radar view of July 10, 2013 and which was not present in a previous radar image seems to have completely disappeared or diluted as the radar view of January 11, 2015 reveals. June 27, 2014: A radar image sent on July 10, 2013 reveals the appearance of an intriguing bright patch dubbed the Magic Island close to the coast of Ligeia Mare. Is it really a new island ? December 31, 2013: The south polar vortex observed from the eye of the Cassini probe in June 2012 has not vanished in 2013 as the natural color views clearly show. This polar cyclone may be related to seasonal factors and the development of the Summer season in the southern hemisphere may favor its development. October 19, 2012: A new radar study put forward that the south polar lake Ontario Lacus may be the remnant of an ancient sea. July 14, 2012: A natural color image of Titan's south polar region taken with the Narrow-Angle Camera of the Cassini probe on June 26, 2012 before a distant flyby reveals a yellow vortex reminiscent of the giant cyclone identified over the north polar region in late 2006. Will it continue to grow as the Winter season is approaching in the southern hemisphere ? February 2, 2012: A team led by Alice Le Gall has shown that the size of the Seif Dunes on Titan is controlled by at least altitude and latitude factors. The Seif Dunes of Fensal which are found at a higher elevation and at a higher latitude than the Belet region appear narrower than those in the Belet area with a wider space between them. Thus, the amount of sand in the Belet region seems higher than the amount of sand in the Fensal region. December, 14, 2010: Scientists have identified via radar and VIMS data a landscape feature which may correspond to a cryovolcanic area made of craters and high peaks in the "Tropical Region" of Saturn's largest moon, Titan. The feature, which appears as the best candidate for cryovolcanism, is called Sotra Facula. July 15, 2010: A radar image of Ontario Lacus, obtained on January 12, 2010, has just been released. The radar data confirm that Ontario Lacus is filled with liquids. Several views of the radar-dark patch allowed scientists to determine that the lake has shrunk during the observation period. December 7, 2009: A new theory suggests that the asymmetry in the abundance of liquid bodies between the north polar region and the south polar region of Saturn's largest moon may be closely related to the eccentricity of Titan's orbit around the Sun because the seasonal factors appear too weak to account for the seasonal phenomena of condensation and evaporation. A new study released on August 13, 2009 in the journal Nature reveals a large cloud outburst in Titan's tropical desert. Near-infrared images of Titan's disk from the Gemini North telescope clearly show a significant bright patch at a low latitude in mid-april of 2008. This finding may explain the presence of drainage channels in Adiri where the Huygens probe landed as well as the equatorial Sand Seas or Seif Dunes, shaped by prevailing winds. Some researchers suggest that the origin of the cloud system may be an eruption of a cryovolcano in the area. A new topographic map based on two different radar images of the same location, released on March 24, 2009 reveals that Ganesa Macula is not a volcanic dome contrary to what the radar images suggest. Its shape is irregular with topographic depressions. Could it be the remnant of a meteoritic impact or a caldera ? A new study based on two images of Titan's south polar region, acquired on July 3, 2004 and June 6, 2005 shows that new pools of liquid have apparently emerged in the time that elapsed between the two observations. This might be the outcome of a strong rainstorm. A research published in Nature in July 2008 and based on infrared images of Ontario Lacus, the giant dark patch in the south polar region, confirms that it is a lake and ethane has been positively identified in this liquid pool. Analysis based on landmarks identified during several Titan passes from 2005 to 2007 reveals a significant crustal displacement, consistent with the presence of a deep ocean beneath the icy shell. The first radar images of Titan's south polar region, captured by the Cassini spacecraft during the flyby of October 2, 2007 unveil new lakes. As a result, one can say that lakes and seas are not only common in the north polar region. Some analysis reveal that the big region of Xanadu is governed by a persistent methane drizzle. An infrared image of Titan's northern latitudes, taken by the Cassini orbiter on February 25, 2007 unveils what appears to be the first sea ever found on Titan. It's roughly as big as the Caspian Sea. A composite infrared image captured by the VIMS onboard the Cassini orbiter during the Titan flyby of December 29, 2006 reveals a giant hurricane-like cloud formation encircling Titan's north pole. It's about half the size of the United States and covers an area that goes from the pole to around 62 degrees north latitude. It is apparently composed of ethane and methane. A close relationship can be made between the lakes observed above 70 degrees north latitude and this cloud formation. Some scientists predict that this cloud will migrate towards lower latitudes as winter turns to spring. The processed image above, using the view taken by the Huygens probe ( of ESA and JPL ) on January 14 2005, shows a rabbit as it would appear on the surface of Titan. The pebble on which the Rabbit stands is 15 cm wide and is 85 cm away from the camera of the Huygens module. The processing work was carried out by Marc Lafferre and Jean-Marc Tantot in September of 2005. The image below corresponds to a snapshot of what the Huygens probe could have photographed when it landed on the surface of Titan on January 14 2005.The size of Saturn on the horizon is well respected: it would appear to your eyes 11 times the apparent diameter of the moon as seen from the surface of our Planet. As a result, the surface of the disk of Saturn would appear 121 times greater than the surface of the disk of the Moon as seen from Earth's surface. On the upper left of the image, the moon has been put in real apparent size so that you can figure out how big Saturn appears in the sky.According to our calculations,the energy radiated by Saturn and received by Titan is twenty times greater than the energy received by Earth and radiated by the Moon. 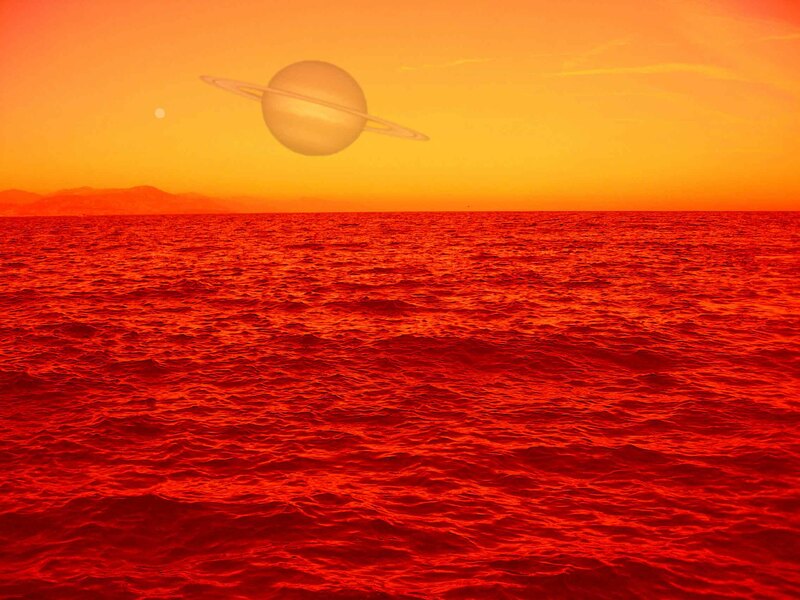 In other words, the energy supplied by Saturn to Titan equals the energy provided by the Sun to a planet orbiting 20 billion km away, that is a little farther than Sedna. The ocean you can see on the picture doesn't consist of water: the environmental temperature is too low to allow the appearence of liquid water on the surface even if the thick nitrogen atmosphere is likely to generate greenhouse effects. So, what kind of liquid can this ocean be composed of ?as the overall temperature on this globe evolves between -180°c and -100°c, we think that the surface is covered with hydrocarbon lakes: the queen molecule might be methane ( CH4) unless it is ethane ( C2H6), acetylene or ammonia ( NH3). 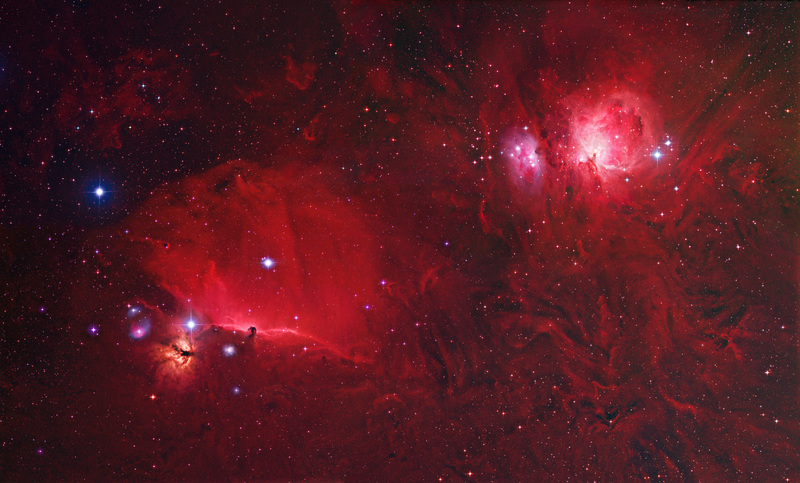 Like on Earth, the atmosphere's composition is dominated by the Nitrogen element. If there is an ocean of methane as we think, one can imagine dark clouds of methane and a hazy weather. Paradoxically, the pressure of the atmosphere is higher than that of our planet: it represents 1.5 Earth atmospheres that's to say around 1500 millibars.Indeed, how to explain that a moon less than half the size of Earth is able to retain an atmosphere which is furthermore heavier than our own atmosphere: we will investigate about that enigma in this web site. Among the 150 major bodies that orbit around our Sun, this orange tellurian sphere that draws our whole attention is the only terrestrial sphere with Venus to be covered with a completely opaque atmosphere. What's beneath this hazy layer? nobody really knows. Now that we better know what's below the Venus's veil, Titan has become by far the most intriguing tellurian sphere in the Solar System. The chemistry of the Titanian world is intimately linked to the satellite's position in the Solar System.That's the reason why we are going to specify, here, the characteristics and the environment of Titan. As a moon, Titan orbits around the gas giant Saturn which is the secong largest planet in the Solar System. The mean distance of both bodies from the Sun is about 1.4 billion km, almost 10 times as far from the Sun as Earth. The environmental temperature at this distance is around -180°c compared to -18°c at a distance similar to Earth's ( the average temperature on the surface of Earth is in fact 15°c thanks to the greenhouse effect).Titan is not the only satellite rotating around Saturn: we have discovered more than 20 moons which are all smaller than Titan. In fact, Titan is the 5th largest tellurian sphere in the Solar System ( Earth, Venus, Mars, Ganymede) ahead of Mercury and Pluto and a little smaller than Ganymede: Titan's diameter is 5150 km compared to 5260 km for Ganymede and 12756 km for the Earth. Contrary to Ganymede, Titan has an atmosphere, that is thicker than the atmosphere of Mars and Earth and here is the Titan Paradox. Titan rotates slowly at a distance of about 1.2 million km from Saturn.It takes 16 days to carry out a complete revolution around Saturn. By comparison, the moon of the Earth gravitates 384000 km from Earth and describes a complete revolution in 28 days. The trajectory of Titan is slightly elliptical. Its position is nearly on the Saturn's ring plane. Titan is by far the biggest moon of the Saturnian System and the only one to hold an atmosphere. The second largest moon is Rhea: it is a satellite heavily cratered and covered with ice. 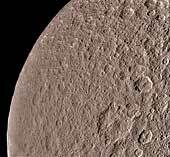 Its size remains modest: around 1500 km across which is too small to retain an atmosphere even at this distance from the Sun.It orbits roughly 500000 km away around Saturn.The image below, unveils the numerous impacts undergone by Rhea on its icy crust. The third largest moon of Saturn is Iapetus, 1400 km across and moving particularly far away from Saturn, that is nearly 3 times as far from Saturn as Titan ( 3.5 million km compared to 1.2 million km). The fourth largest satellite of Saturn is Dione: its diameter is close to 1100 km and it lies on average 400 000 km away from Saturn.There is speculation about the possibility of cryovolcanism on this moon.As you can see on the image beneath, the surface seems quite smooth though heavily cratered. 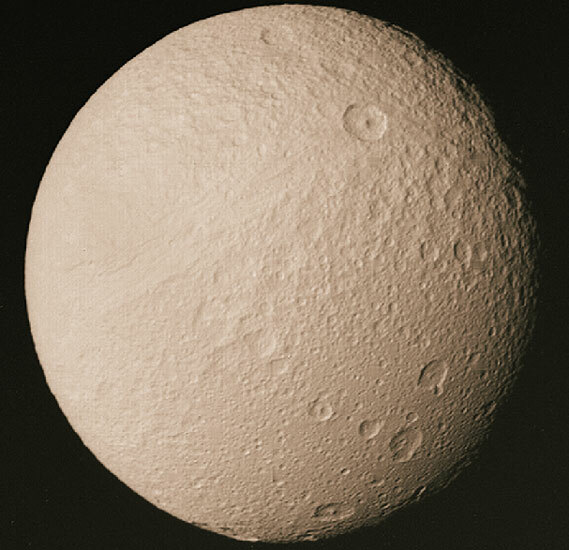 The fifth largest moon of Saturn is Tethys: it orbits nearly 300 000 km away from Saturn and its size is a little smaller than Dione with a diameter close to 1050 km. This moon has the particularity of presenting a huge crack or a kind of deep canyon that stretches from pole to pole: we call it the crack of doom.The following image of Tethys shows up how hard it is to distinguish Tethys and Dione. Among the thirty major bodies evolving around Saturn that we have identified up to date, six satellites are at least 500 km wide that is a size from which the bodies are slightly spherical.The sixth largest moon, Enceladus, is part of the list with a diameter of 500 km. Fifteen bodies orbit farther around Saturn than Titan,notably Hyperion, Iapetus and Phoebe. One major topic of research is to understand the numerous interactions between all the bodies that are moving around Saturn in order to figure out their past, their present and their future: for instance, there is an open question over the origin of Phoebe: is it a captured asteroid ? Another major enigma regarding the Saturnian System and that might involve Titan is the nature of the dark, presumably organic material which covers one half of the Iapetus's surface, engendering an immense contrast between its faces. A prevailing theory has attributed the dark area to dust knocked from Phoebe landing on Iapetus, or somehow modifying it by impact. But in 2000, a new element appeared: by analysing the spectrum of Iapetus, Toby Owen identifies significant amounts of nitrogen. As a result, the following theory can emerge: since Titan's atmosphere is mostly composed of nitrogen, the scientist makes the hypothesis that the dark material on Iapetus comes not from Phoebe but from Titan. Obviously, it remains to specify the process which has led to this phenomenon. 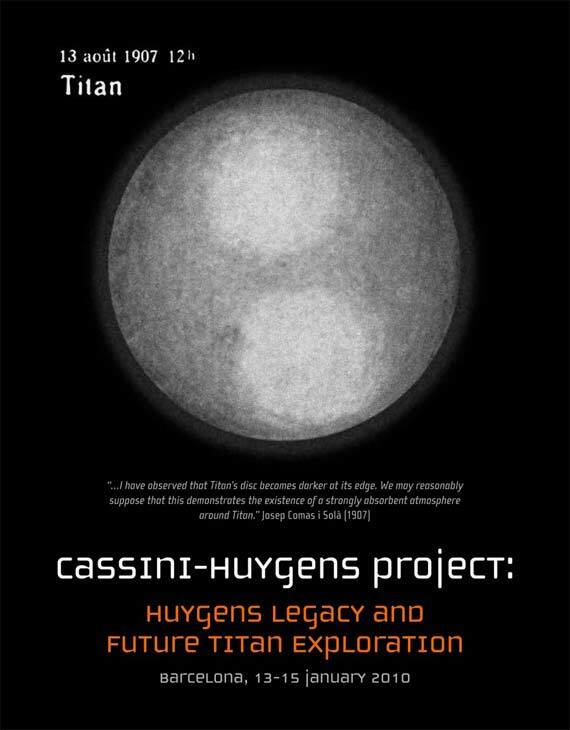 Titan was discovered in 1655 by a gifted young dutchman, Christiaan Huygens, thanks to a major advance in telescope making.Fourty five years earlier, Galileo had recorded his first observations of Saturn in July 1610 but his telescope may not have been good enough to discern the dim reddish spot of Titan. The main neighbouring moons of Titan would be discovered few years later by Jean Dominique Cassini: Iapetus in 1671, Rhea in 1672, Dione and Tethys in 1684. William Herschel would also bring his contribution by discovering Mimas and Enceladus. The atmosphere of Titan would not be identified until the beginning of the twentieth century: in August 1907, José Comas Solà observed Titan with a 38 cm telescope in Barcelona, Spain.He wrote:"one sees two round, whiter patches, which give the appearance of a blurred double star: we may suppose reasonably that the darkening of the edges demonstrates the existence of a strongly absorbing atmosphere around Titan".But with the technical means he used,one can think that what he observed and drew was a very subjective interpretation. So, it is difficult to argue that José Comas Solà discovered the atmosphere. However, in 1925, the british astrophysicist Sir James Jeans was going to demonstrate that it is highly probable that Titan harbors an atmosphere.He applied his "Dynamical Theory of Gases" published in 1904 to Titan. He concluded that Titan may be massive enough and cold enough to retain an atmosphere.His calculations showed also that light gases, such as hydrogen and helium would be too light to be abundant in the atmosphere.Heavier compounds must evolve in the atmosphere.The leading candidates included the molecules of Argon, Neon, Nitrogen and Methane. A crucial breakthrough happens in 1944: the Dutch American astronomer Gerard P Kuiper showed, by recording the spectrum of Titan, that it contained absorption bands identified with methane gas. Every scientist could say:"Titan's atmosphere consists of methane".In 1980, the Voyager 1 spacecraft revealed how incomplete the Kuiper's analysis was: indeed,it detected large amounts of nitrogen in the atmosphere, perhaps between 85 and 95% of nitrogen in the atmosphere.As a result, methane was not the most abundant molecule in this gas layer. As on Earth, the nitrogen atoms pair up to form molecules N² and the pressure at the surface of the satellite appears one and half times greater than atmospheric pressure on Earth. Voyager 1 also showed that Titan was in fact smaller than Ganymede.The depth of the thick and opaque atmosphere of Titan is so high that Titan appears larger than Ganymede: nevertheless, the difference of size between the two bodies is very weak. Titan has inspired many people and notably, the noveller Arthur C Clarke who involved Titan in his novel "Imperial Earth", written in 1976: it features the latest ideas about Titan's surface.In his story, the surface temperature is raised by a strong greenhouse effect and a large hydrocarbon lake is present, representing an attractive fuelling stop for the visitor.